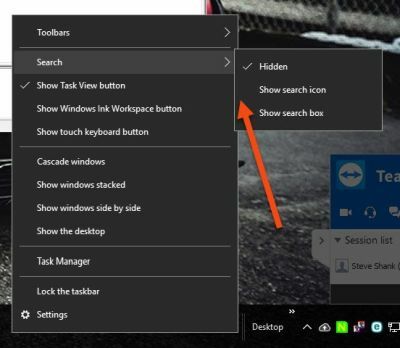 Many have failed to observe the options available for the search bar in the taskbar on Windows 10. Each new version of Windows has improved the search function. Windows also indexes your stuff for quicker access. But first, let's see how to control the search bar itself. 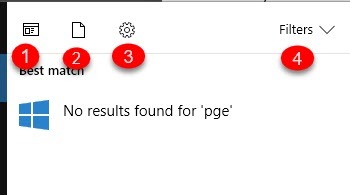 On a normal tower computer, the full search bar is useful as you can click there and immediately search, however on a laptop, you might prefer the smaller icon only if space is limited on your taskbar. If you right-click on an empty area of the taskbar (where all the little icons are), you'll see search and your three options. I don't like Windows searching the Web for me. I use the Windows search only for searching my own computer. Choose settings then Search then turn off cloud search. - I also turn off device search. You have some easy control over your search. The three icons at the top give you quick control. The Filters pull-down offers even more. When I searched for PGE this is what I got. The Filters pull down is even more options. So, when I clicked the documents icon, I got these results. However, the search will also search inside many types of documents. 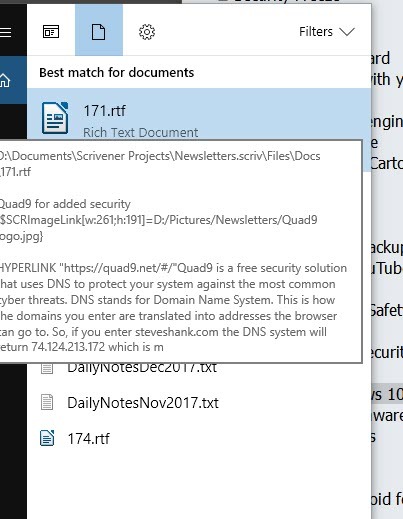 So, when I searched for Quad9, which I was writing about for another article, I got these results. All from inside of documents, research, and notes. 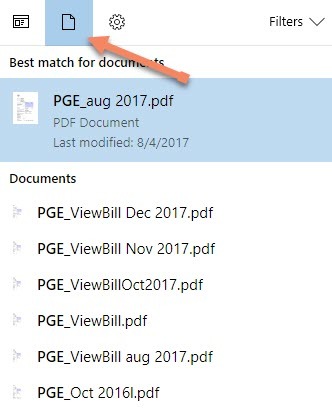 If you point to a document, your search will present a summary of it, so you can more easily determine if it is the correct document. Besides offering more search places, the Filters pull down also allows you to add more search locations. Remember though, the more search locations the slower the search and the more time your computer is going to spend indexing.